When protests broke out after a police officer shot an unarmed teenager in Ferguson, Missouri in August, police in camouflage gear wielding assault rifles and stun grenades drove through the city in armoured vehicles attempting to control the crowds. In the wake of the protests, Reuters photographed police officers around the world and asked them when they’re legally permitted to use force to control crowds. While answers varied, most officers responded that their use of force must be preceded by a warning and proportional to the resistance they encounter. 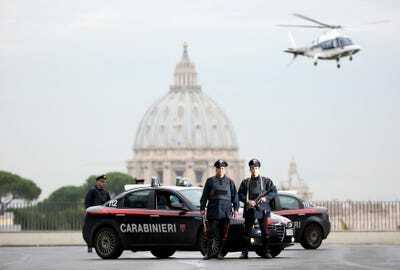 In Italy, police must follow guidelines that allow for the use of weapons only in the line of duty, when it is an “unavoidable necessity to overcome resistance, stop violence, or prevent a [serious] crime,” an officer said. Italian Carabinieri pose in front of St. Peter’s Basilica as a Carabinieri helicopter flies overhead, in Rome Nov, 12, 2014. 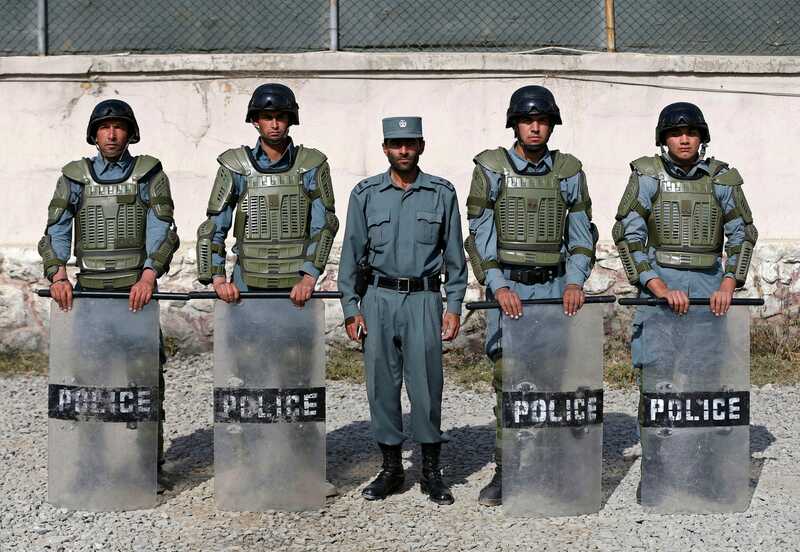 Afghan police “can use weapons or explosives against a group of people only if it has … disturbed security by means of arms, and if the use of other means of force … has proved ineffective,” Afghan police officer Zabiullah, 24, said. Police must also issue at least six warnings — three verbal and three warning shots — before they use force. Afghan anti-riot policemen (R-L) Habib, 21, Sayed Rahman, 22, Mohammad Nabi, 22, Momin Khan, 22, and Abdul Ali, 25, pose for photo at their base in Kabul Oct/ 12, 2014. 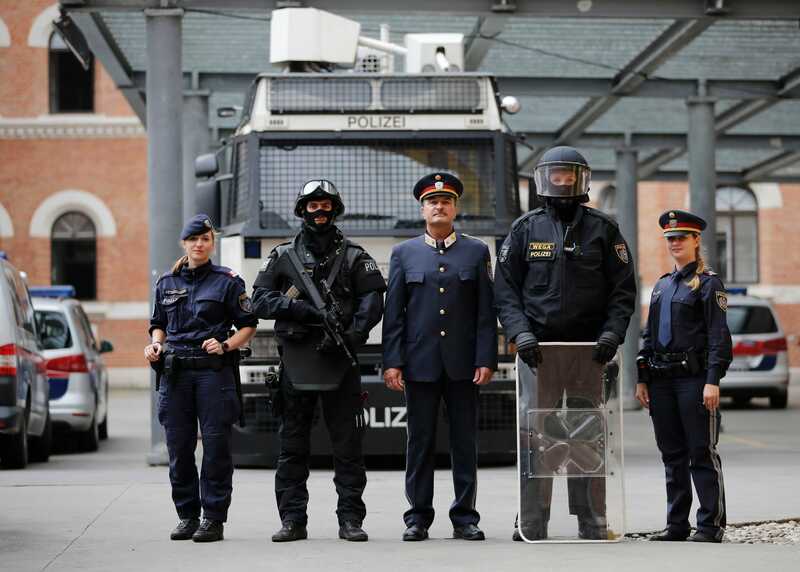 In Bosnia, police say they may use force ranging from batons to chemical irritants, water cannons, “binding agents, special firearms and explosive devices.” They must issue a warning first, however, and can’t use force against the young, old, or disabled (unless they are armed). 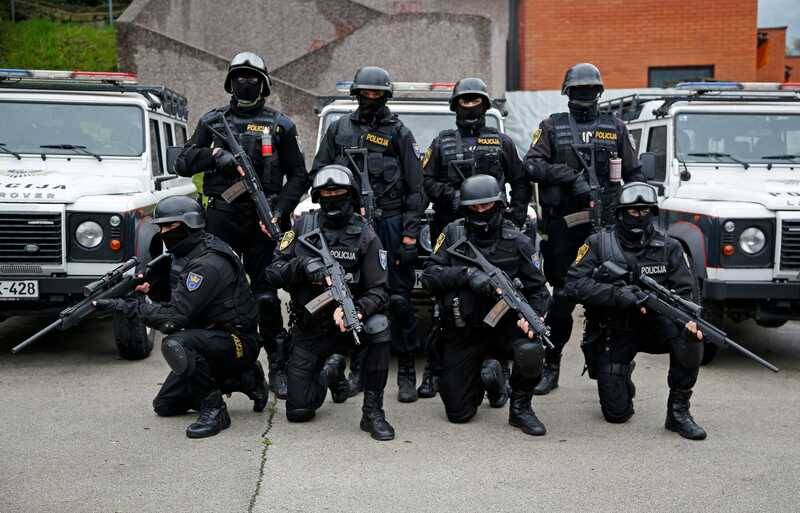 Members of Special Police Support Unit pose for photo in front of their base in central Bosnian town of Zenica, Oct. 3, 2014. 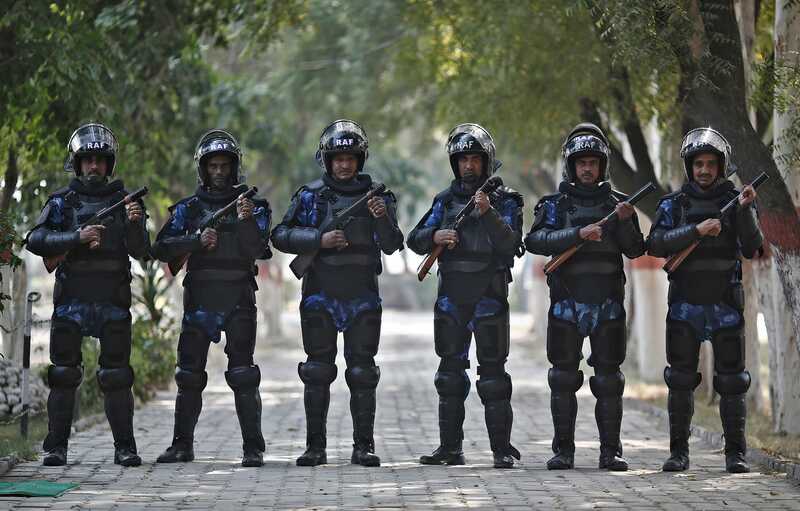 The Indian Rapid Action Force responds when violence breaks out that the police can’t contain. A magistrate must consent to their deployment, and they are required to warn crowds before they escalate their use of force from tear gas and rubber bullets to firearms. 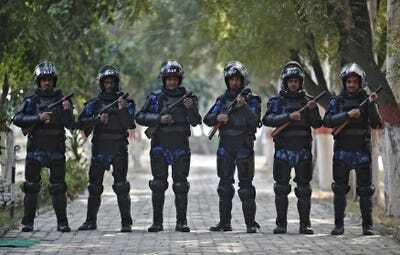 India’s Rapid Action Force (RAF) personnel pose for pictures inside their base camp in New Delhi Nov. 6, 2014. When violence erupts in Mexico City, the police apply a progressive scale of force much like the one used by the Indian RAF. They must first issue verbal warnings and try to contain protestors’ movement. If that doesn’t work, they may use non-lethal incapacitating weapons. 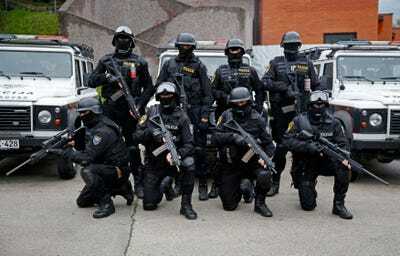 Police use firearms and lethal force only as a last resort. 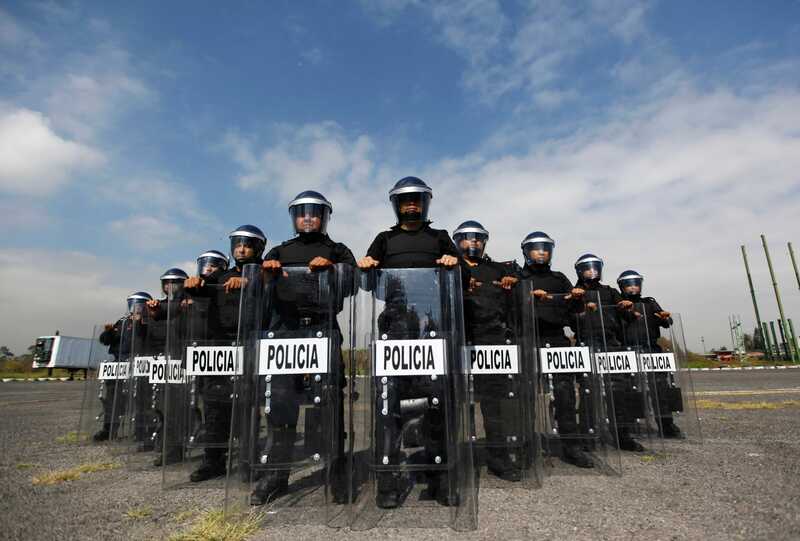 Members of the Task Force for Mexico City pose for a photograph at their base in Mexico City Oct. 15, 2014. 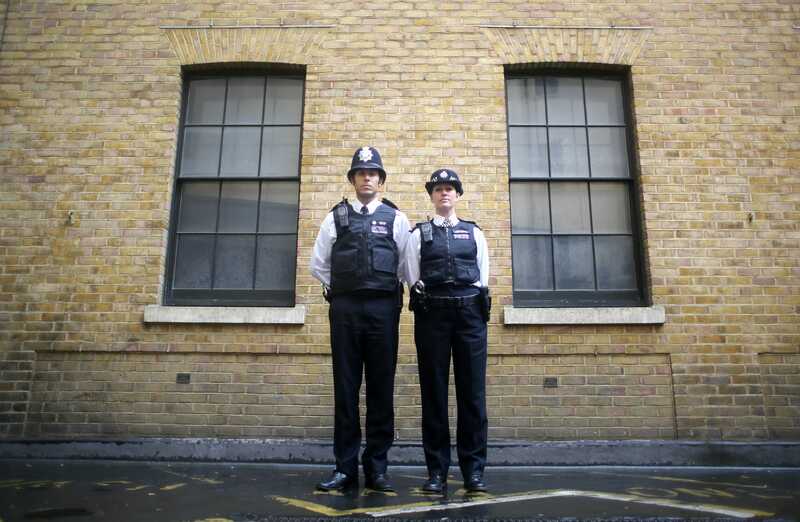 Police constables Ben Sinclair and Karen Spencer pose for a photograph wearing their Metropolitan Police beat uniforms, in London, Oct. 9, 2014. In Austria, police are only allowed to use force when less dangerous methods appear inappropriate or have proved to be ineffective. Police have to issue a warning before they use force, and they must also make an effort to avoid seriously injuring anyone where possible. 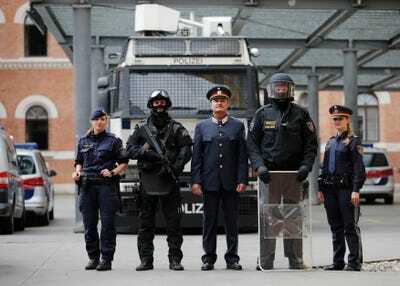 Austrian police officers pose in various uniforms in front of a water cannon at their headquarters in Vienna Oct. 8, 2014. Venezuelan police are not allowed to carry firearms at all when patrolling peaceful demonstrations. If violence erupts or order is threatened, police are instructed to warn crowds or demonstrators that there will be a “progressive, differentiated use of force.” Officers must try to avoid harming children, the elderly, and other vulnerable groups. 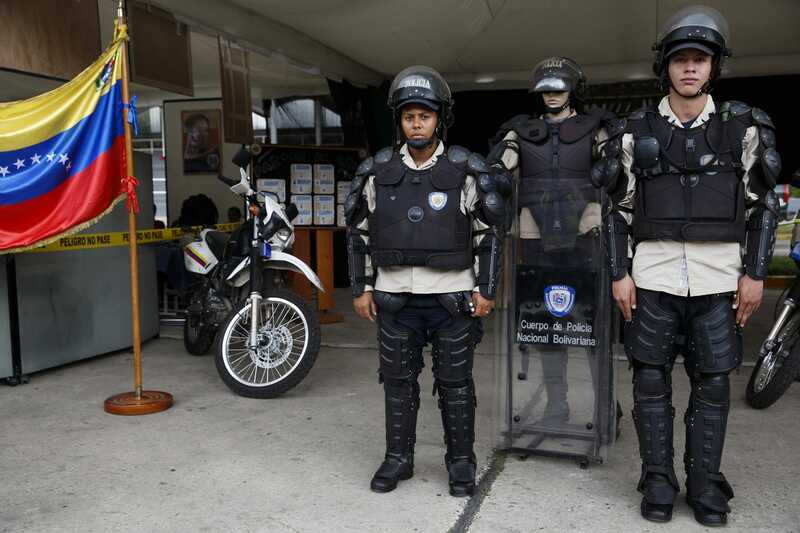 Venezuela’s national police officers Bello (R) and Bogado pose for a picture with their riot equipment, next to a mannequin in uniform during a government Christmas fair in Caracas Nov. 13, 2014. While Belgian police are allowed to use lethal force in self-defence or to confront armed perpetrators, they are never allowed to use firearms for the purpose of crowd control, according to human rights monitors. 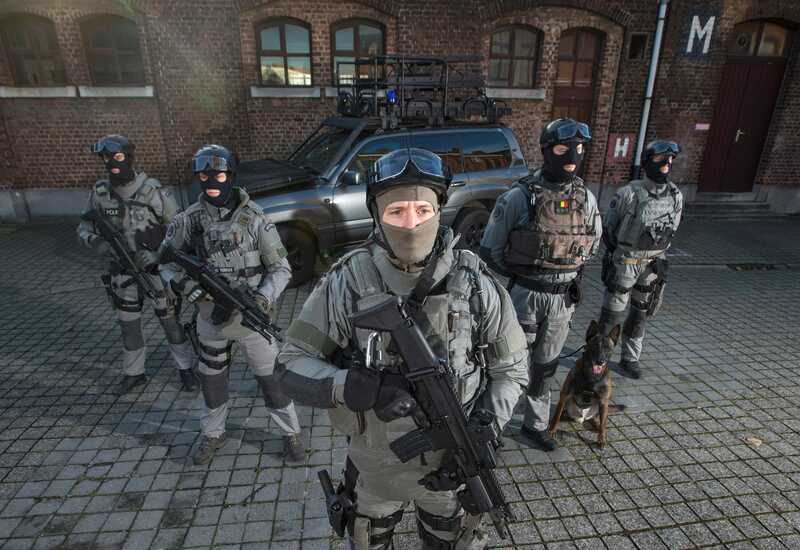 Members of Belgium’s special forces pose for pictures at their headquarters in central Brussels Nov. 24, 2014. Malaysia’s public order police, the Federal Reserve Unit, are only allowed to use firearms if the protestors are using firearms, too. The FRU was formed 59 years ago and firearms have never been used. 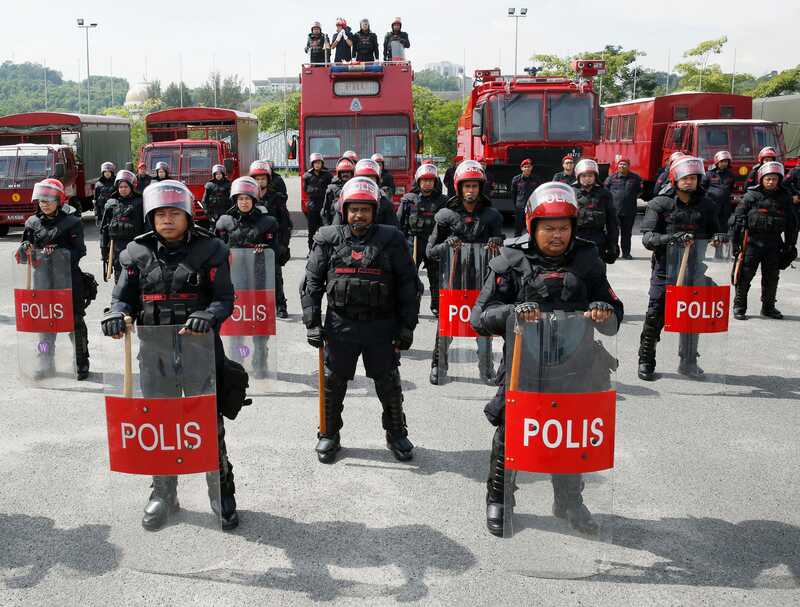 Malaysia’s public order police, the Federal Reserve Unit (FRU), pose for photographs wearing riot control equipment at their headquarters in Kuala Lumpur Nov. 20, 2014.